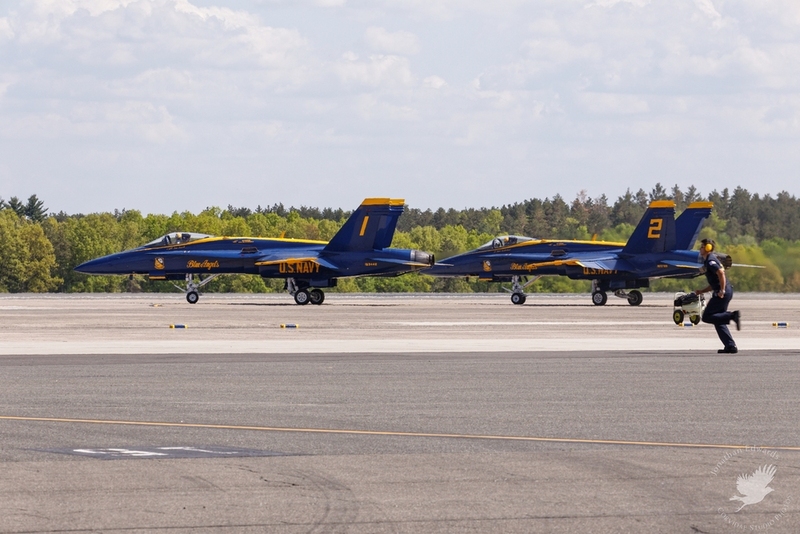 Our first official airshow event of the year was The Great New England Airshow at Westover Air Reserve Base in Chicopee, MA, and I can tell you that it was a bit of a mixed bag. 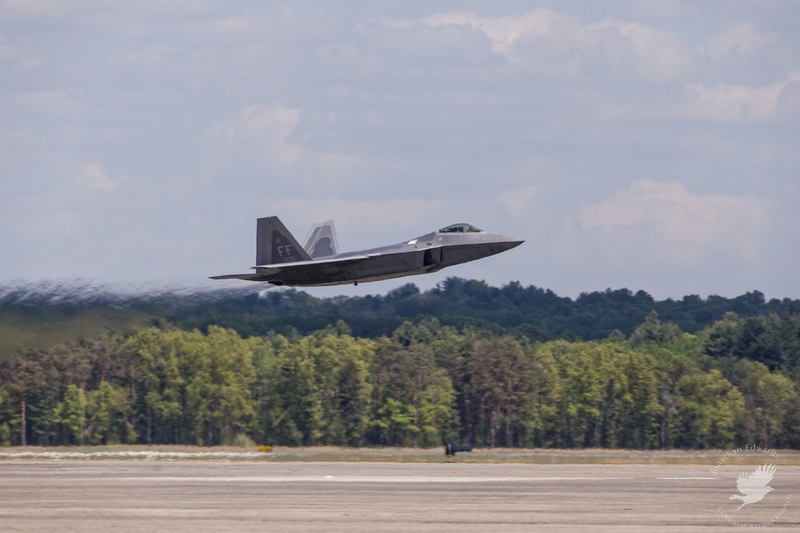 I knew going into it that the layout of the base was going to make photography somewhat challenging, but combined with the distance of the show line, the weather, security restrictions, and massive traffic tie-ups made for a fairly wearying experience. That isn't to say though that we still didn't get some good photos and generally enjoy the show itself, it's more that it's debatable that it would be worth it to return or for a first time photographer to bother. We did attend both days, although we didn't spend the full day there on Saturday due to the weather as well as delays getting into the show. At any rate, on to the details about the show. 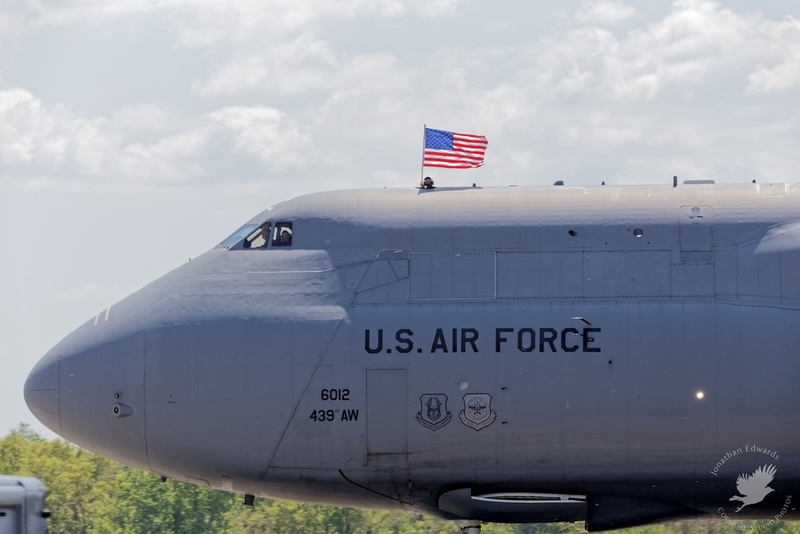 We were excited to attend Westover as I knew it was a C-5 Galaxy base, the massive USAF cargo aircraft which I had only ever briefly seen once before (on approach to CYOW over our house) and the opportunity to see one flown in the airshow wasn't to be missed. 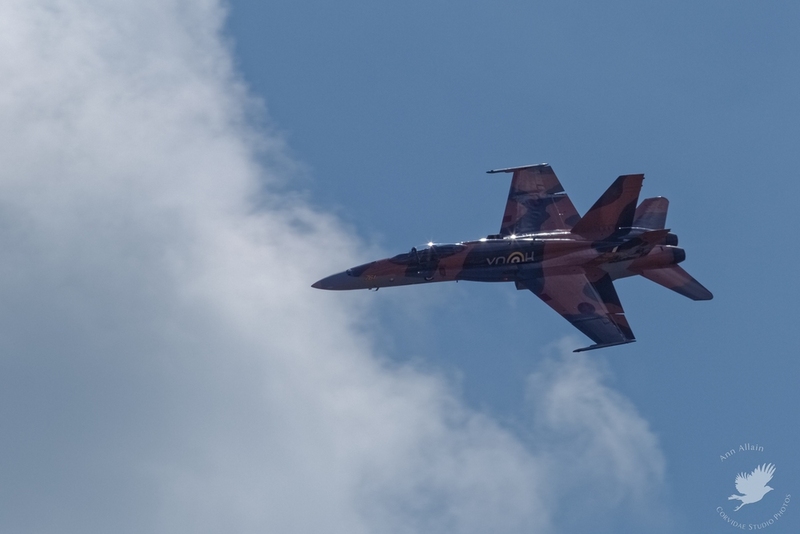 Also of major interest to us was the chance to see the RCAF CF-18 Hornet demo in its 75th Anniversary Battle of Britain colours which I knew I wouldn't see this year until September most likely. 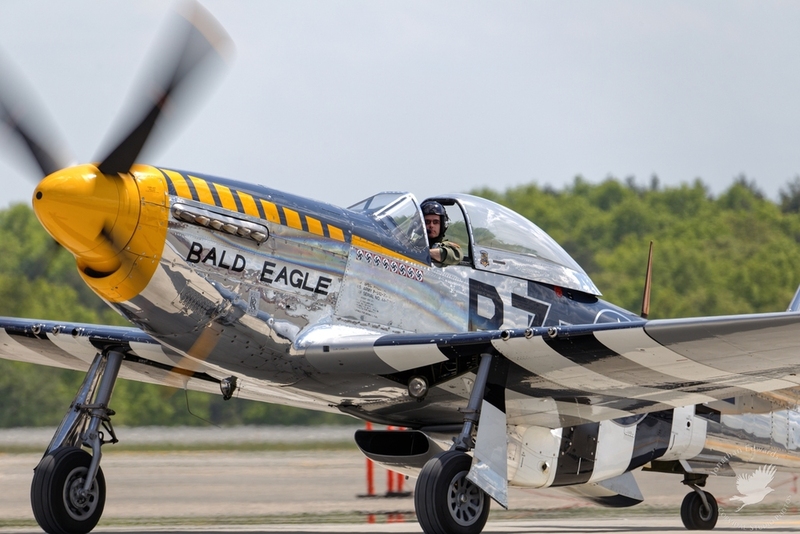 Aside from those attractions, other performers included several warbirds such as P-51 Mustangs "Never Miss" and "Bald Eagle", Corsair "Skyboss", TBM Avenger "She's The Boss" and B-25 Mitchell "Miss Hap". 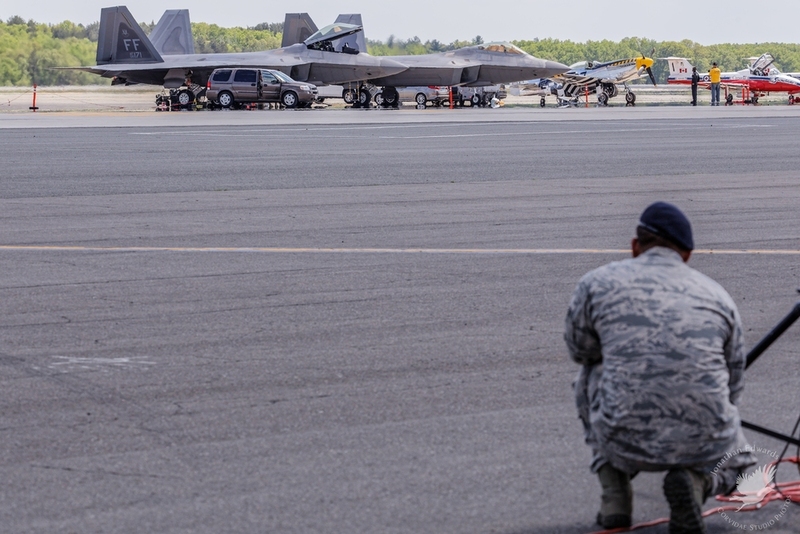 Aside from the warbirds, the USAF was represented by the aforementioned C-5 Galaxy and the F-22 Raptor demo team, with the USN providing the always entertaining Blue Angels team. 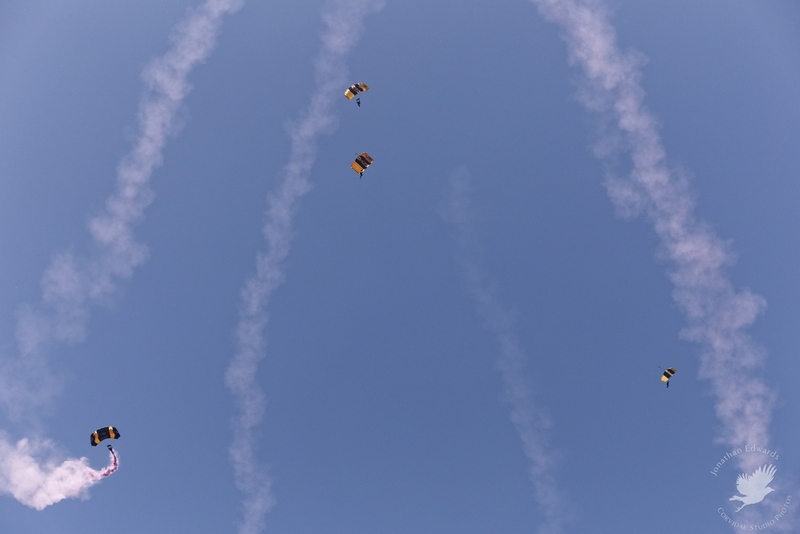 The US Army Golden Knights and RCAF Snowbirds rounded out the military teams on display. 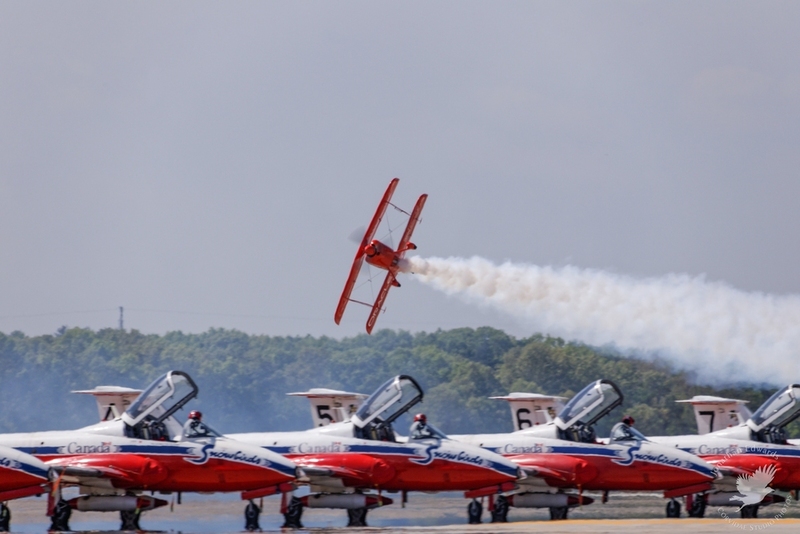 Civilian performers were Sean D. Tucker in the Oracle Challenger, Rob Holland Ultimate Airshows with his MX-S/RH, and the GEICO Skytypers with their SNJ's. 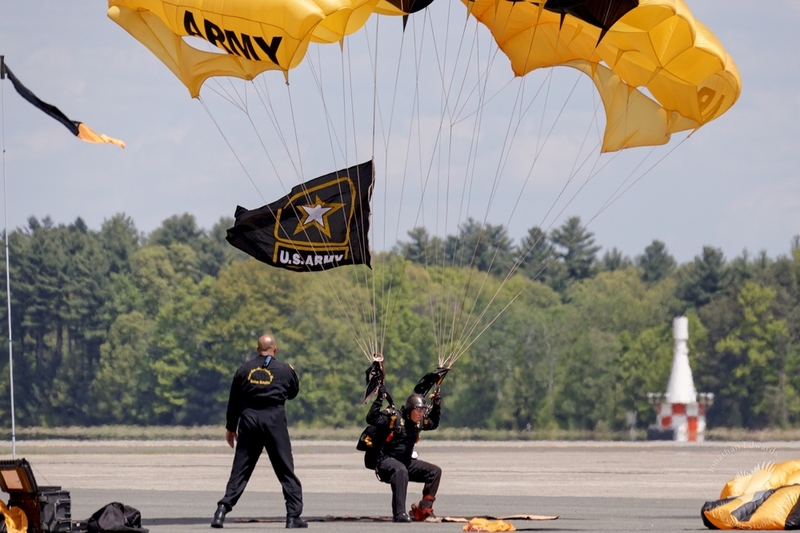 The US Army Golden Knights kicked off the show timed with the US and Canadian national anthems, jumping from their Fokker C-31A Troopship. 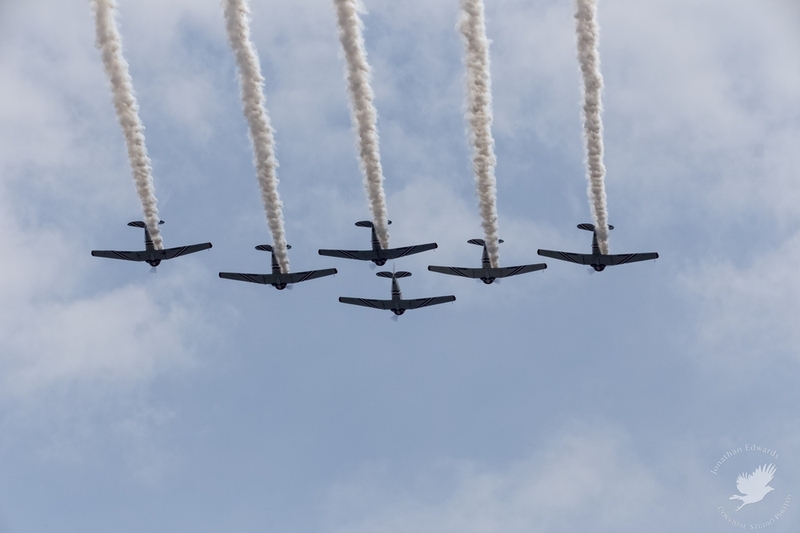 Following the Golden Knights, the warbird performers took to the air, represented by Mike Murphy's P-51D "Never Miss", Charlie Lynch's TBM Avenger "She's The Boss", and American Airpower Museum's FG-1D Corsair "Skyboss" and B-25 Mitchell "Miss Hap". 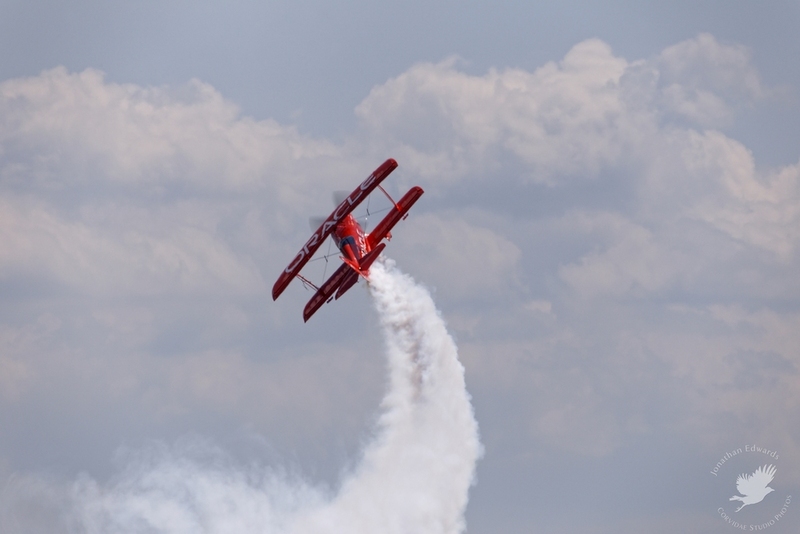 While the warbirds were forming up, Sean D. Tucker also flew a short display in the Oracle Challenger. 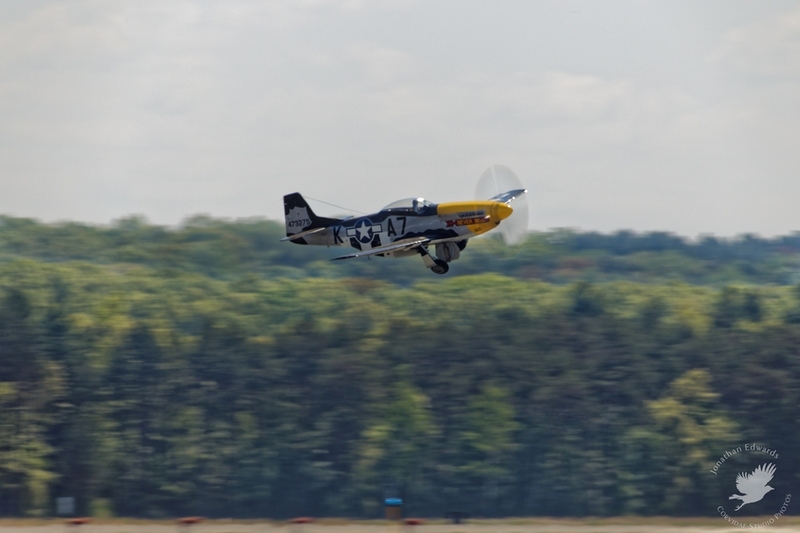 Following Mr. Tucker's display, the warbirds performed several racetrack passes as well as a formation pass, then Mark Murphy put his Mustang through its paces in an aerobatic display. 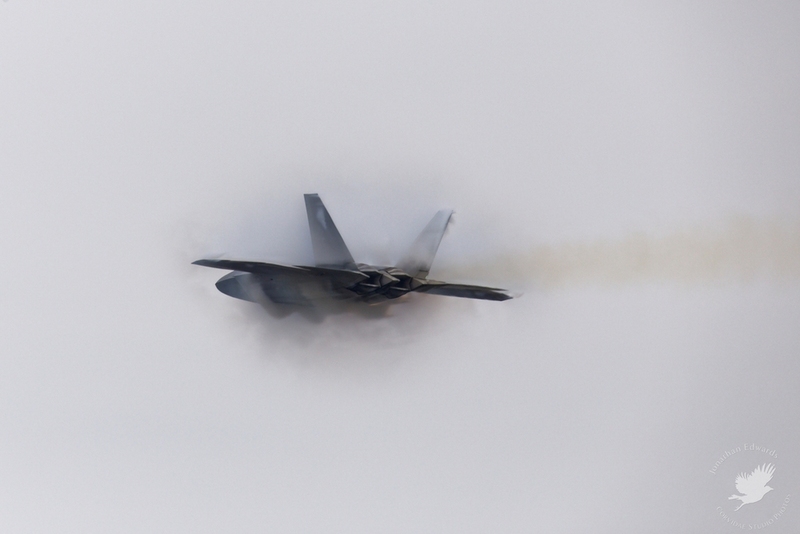 As you can see from the warbird shots, the far show line made it a long reach even with the 150-600mm. Also, the south facing orientation of the show made for tough, hazy, backlit conditions for photography. 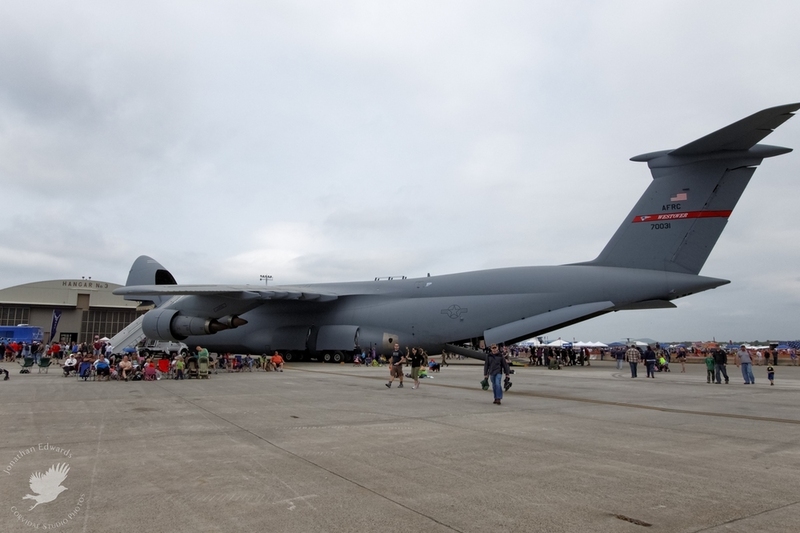 Following the warbirds display, the mighty Lockheed C-5 Galaxy returned to the show box after having taken off before the show to perform a few passes as well as a dirty pass demonstrating the sideways rotating and retracting nature of the massive landing gear. 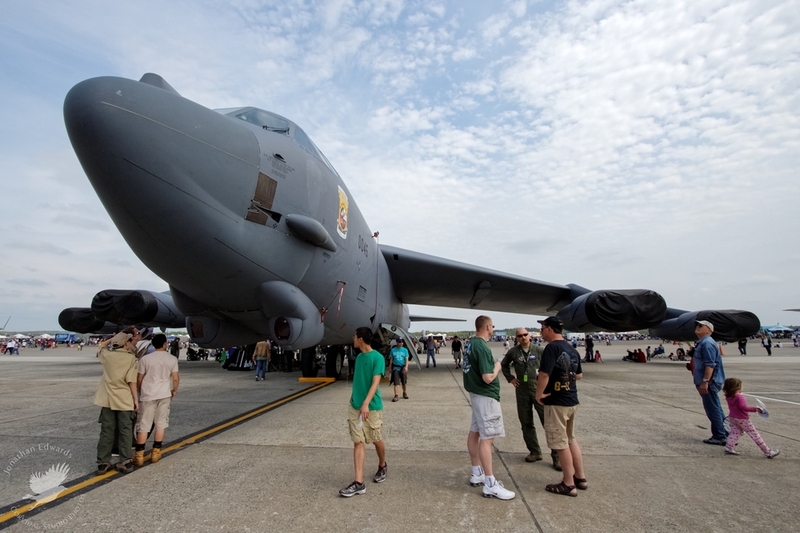 While slow moving and slow turning, seeing the enormous aircraft up close was a treat. 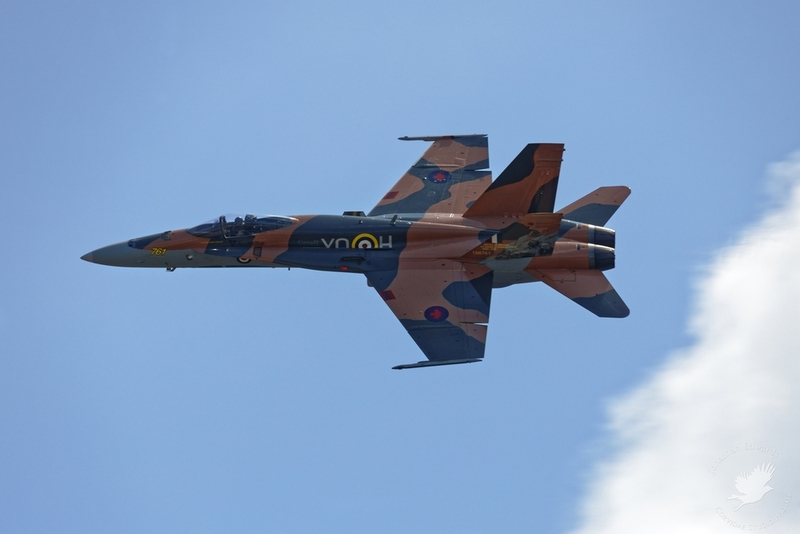 Up next was the much anticipated RCAF CF-18 Hornet demo in her new Battle of Britain colours. Capt. Denis "Cheech" Beaulieu performed the familiar but still entertaining routine featuring various high speed and slow high alpha and dirty passes. Again, the lighting made for a real challenge to photograph the beautiful colour scheme on the Hornet, hopefully I'll have a chance to see it again this year under more favourable conditions. 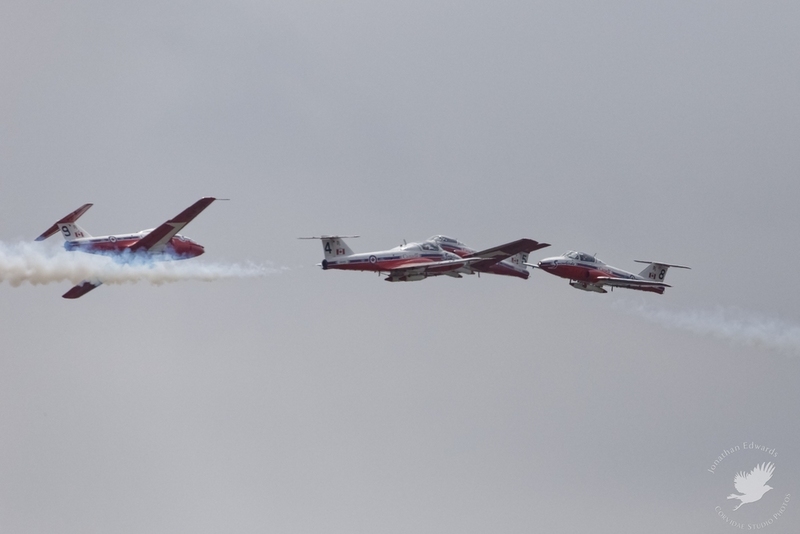 More RCAF action followed the Hornet with the world-famous Snowbirds, with their Canadair CT-114 Tutors entering their 45th year of service with the display team. 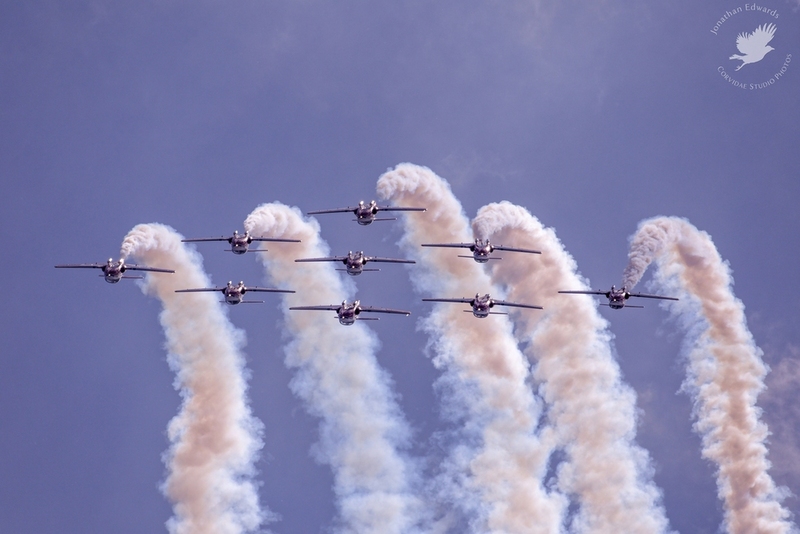 It was great to hear the American crowd show their appreciation for the Canadian team, who performed with their usual professionalism and precision. The low show was performed Saturday due to cloud cover with the high show on Sunday. 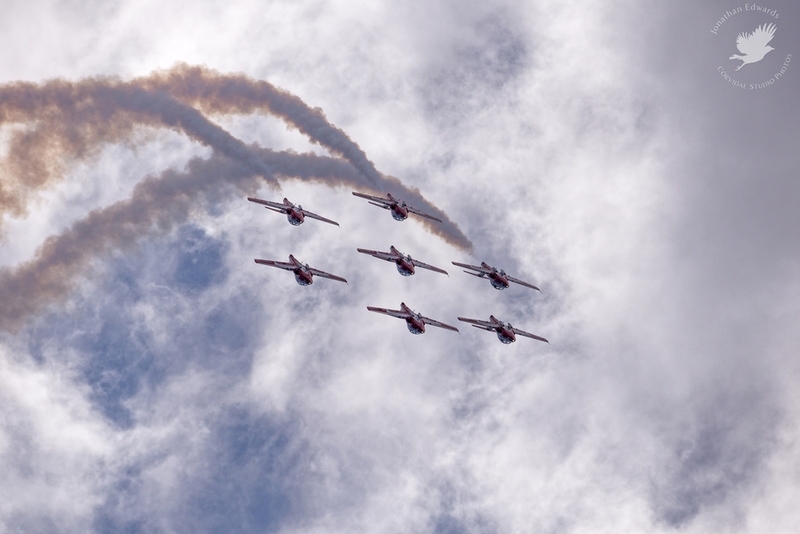 Continuing in the formation team vein, the GEICO Skytypers next took to the skies in their vintage North American Aviation SNJ-2 and -4 aircraft, demonstrating a variety of WWII-era training maneuvers that student fighter pilots would have learned in that period. The snarl of those P&W Wasp radial engines always makes me smile! 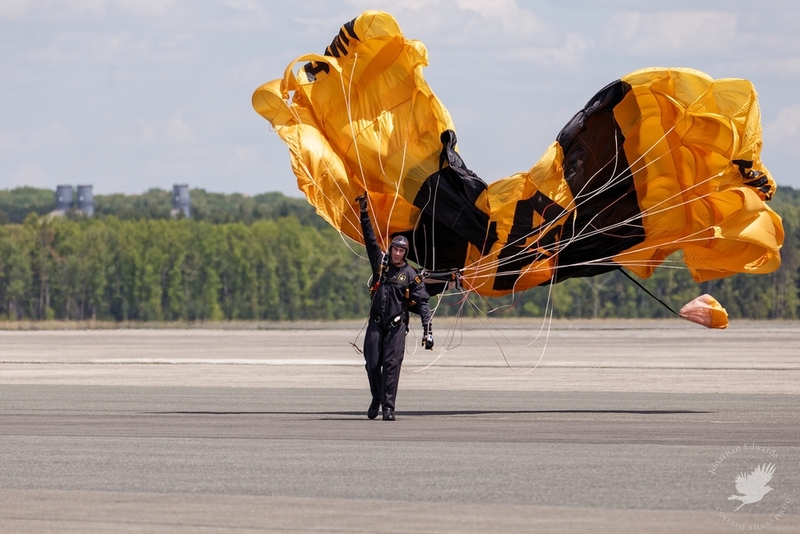 The Golden Knights performed again with a slightly more extensive performance than in the morning, leading into Sean D. Tucker's next performance in the Oracle Challenger. Mr. Tucker pushes his aircraft hard and is a lot of fun to watch, especially his extremely low passes done at high speed. 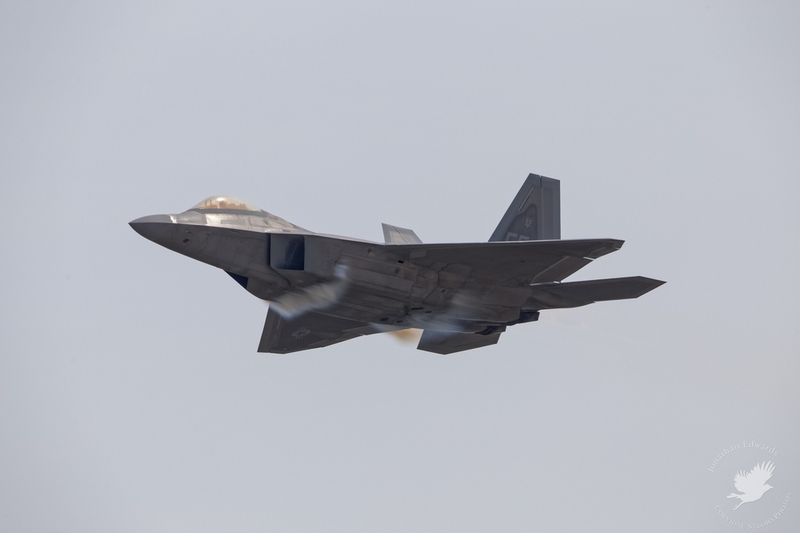 While Sean Tucker was pushing his aerobatic aircraft around the show box, the roar of the F-22 Raptor and P-51D Mustang "Bald Eagle" could be heard in preparation for their routines. 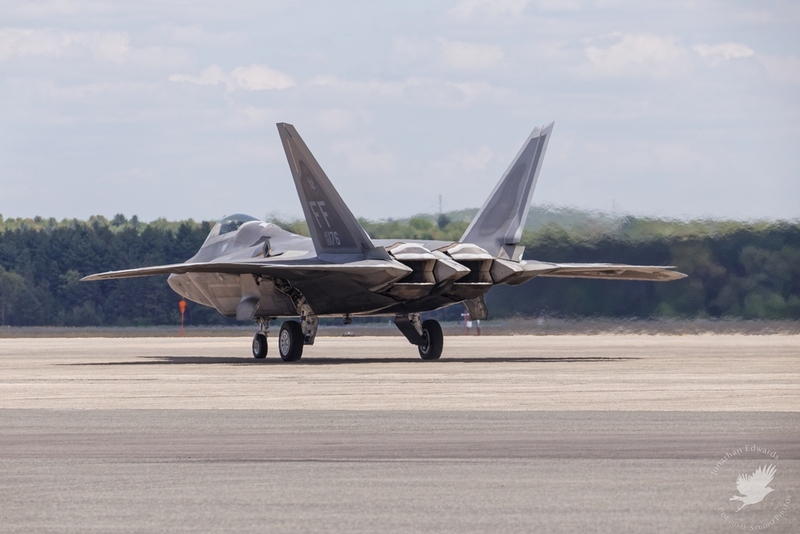 The F-22 performed its remarkable demo of speed and maneuverability unheard of in other jet fighters. I had seen it perform last year at Rhode Island and this year's performance was no less thrilling than before. 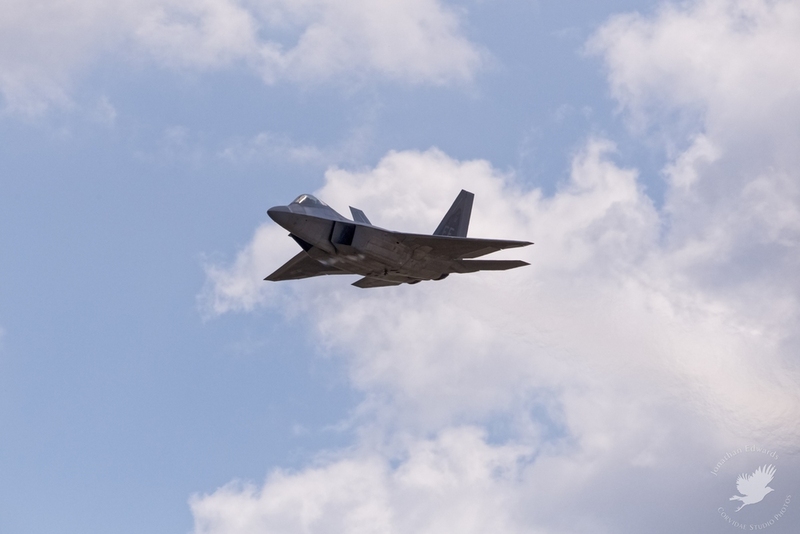 With its solo demo done, the Raptor was joined by Jim Beasley in his Mustang for several passes in the USAF Heritage Flight, a very stirring sight with the pinnacle of fighter aircraft technology of their respective eras on display. 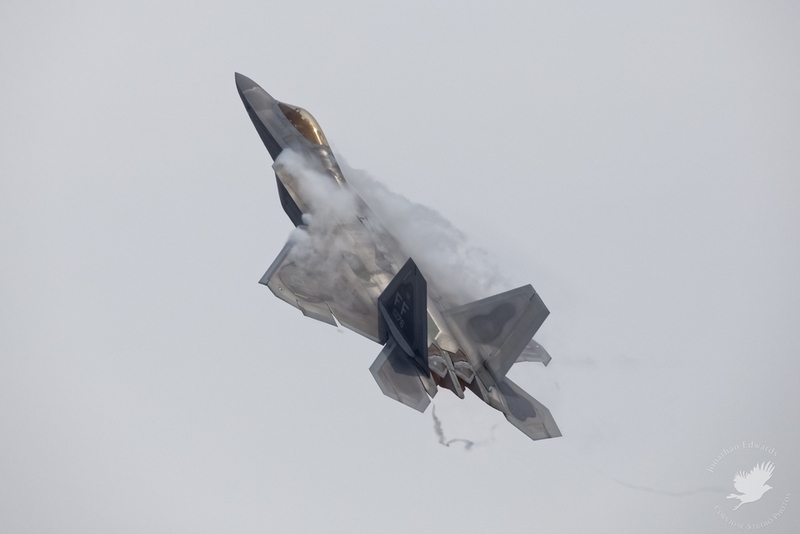 The Saturday display had the added benefit of the damp air providing some fantastic vapour action on the Raptor, despite the grey skies and low clouds. With the Raptor and Mustang returned to the ground, Rob Holland then proceeded to wow the crowd with his MXS/RH aerobatic aircraft. 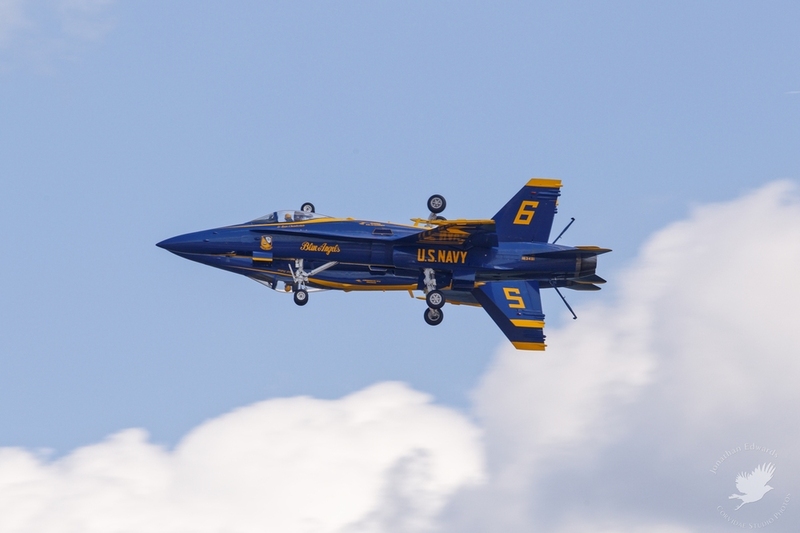 Mr. Holland flies a rambunctious routine that seems a little more wild and unpredictable than Sean Tucker, an interesting contrast between the two pilots. 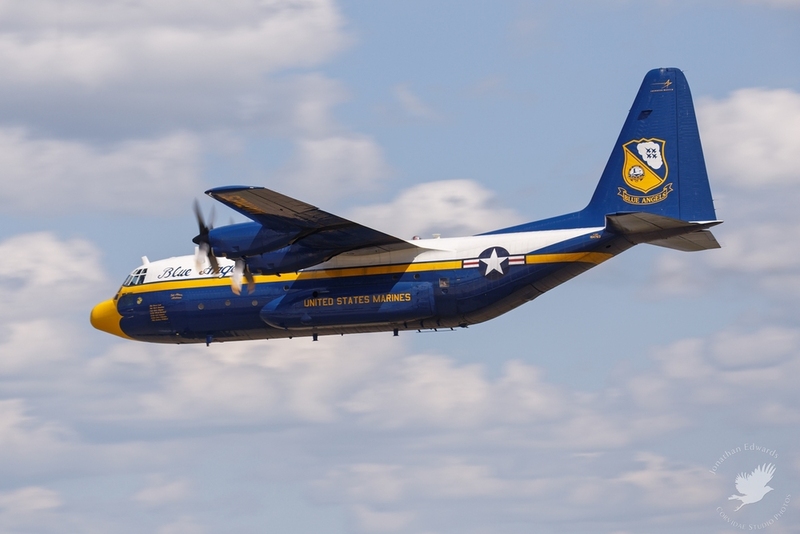 With the conclusion of Rob Holland's display, the Blue Angels' transport aircraft, the C-130 Hercules "Fat Albert" blasted into the sky. 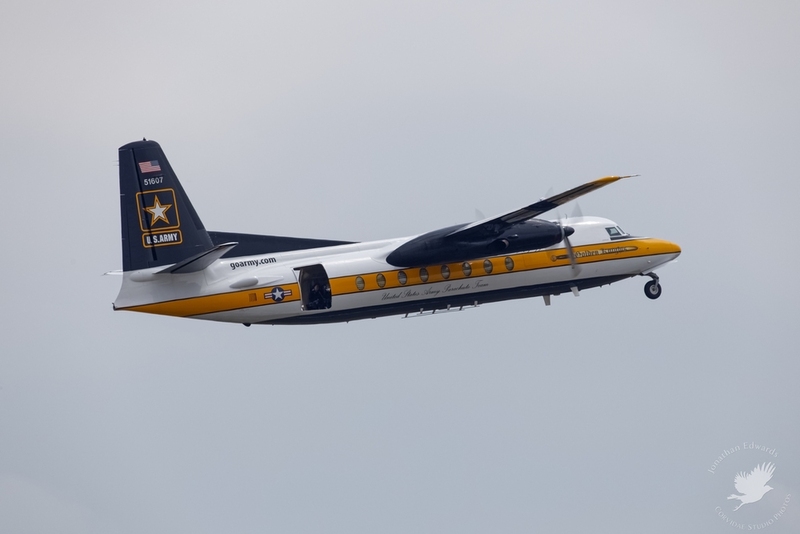 Fat Albert did some passes at considerable speed for a turboprop transport, and then demonstrated a tactical assault landing. 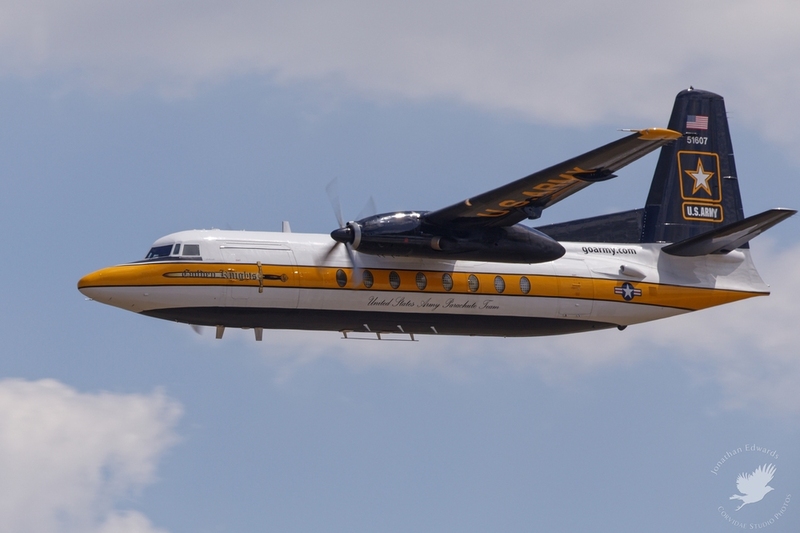 Unfortunately, due to the distance of the show line as well as the layout of the aircraft parking area, much of the landing and demonstrating of Fat Albert taxiing in reverse was hard to see, let alone photograph. 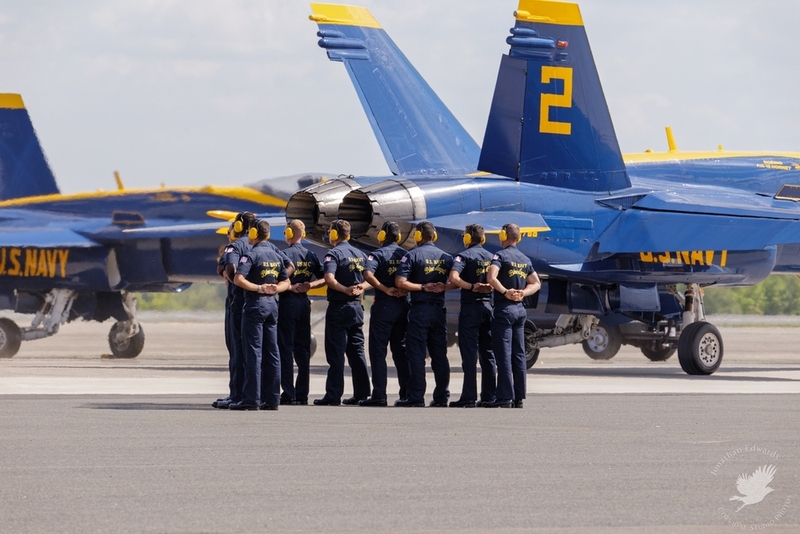 For the finale, the Blue Angels pilots and ground crew made quite the choreographed spectacle of performing their ground checks through to the engine starts and finally taxiing to takeoff position. Our spot along the show line directly in front of team lead Capt. 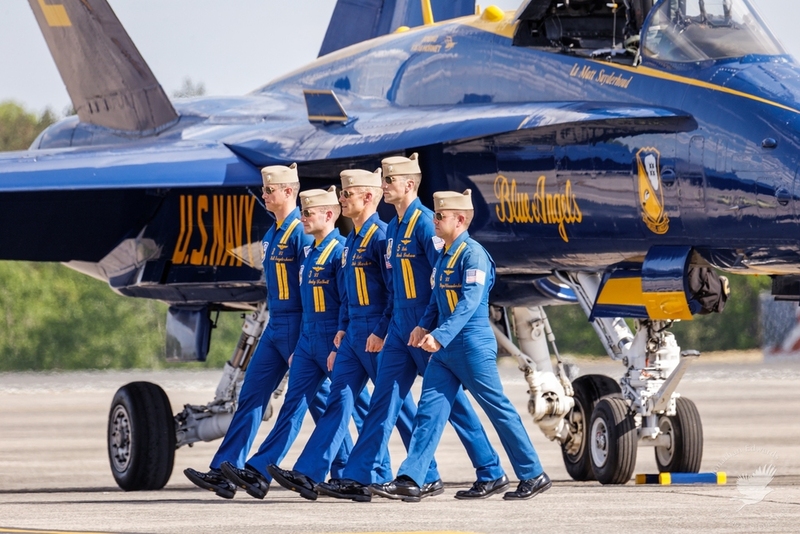 Tom Frosch's number 1 F/A-18 Hornet gave us a great view of the ceremonial prep and departure. 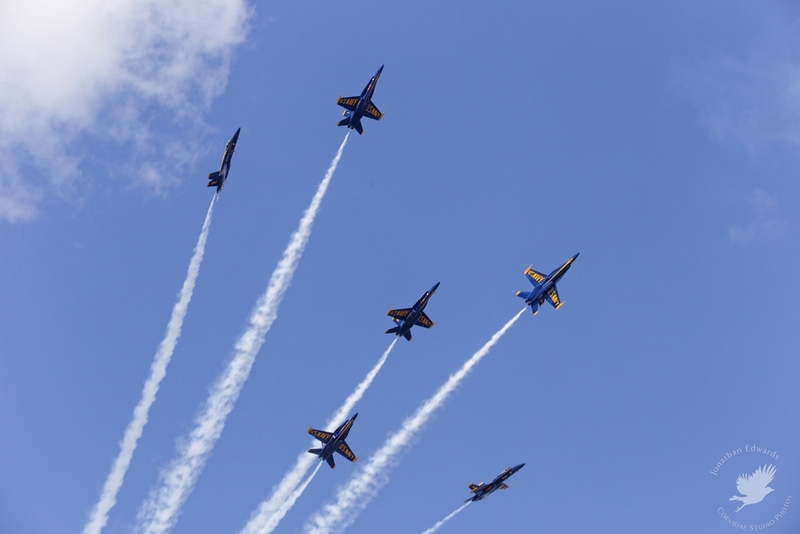 The Blue Angels form up their 4 ship formation on the ground for takeoff with the solo aircraft 5 and 6 taking off in the opposite direction, making for a unique start to the performance. 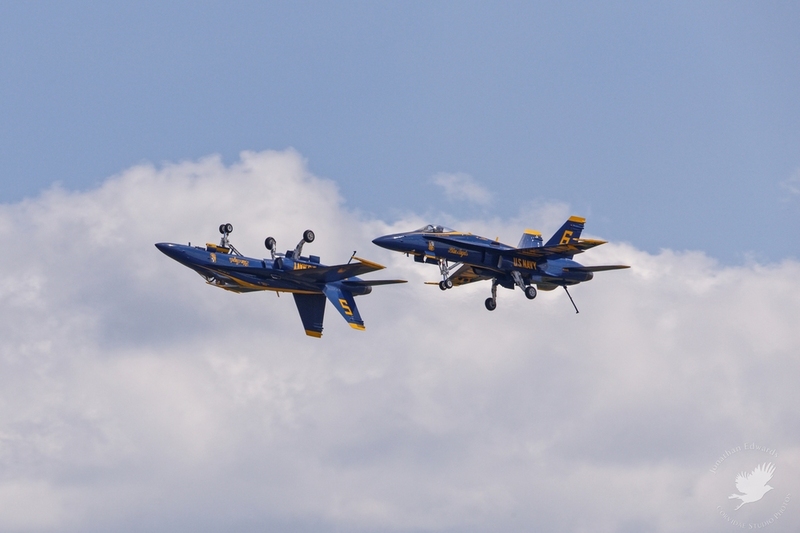 Once in the air, the Blue Angels alternated formation and solo passes, with the solos performing quite a few opposing passes, thrilling to watch due to the speed and power of their Hornets. 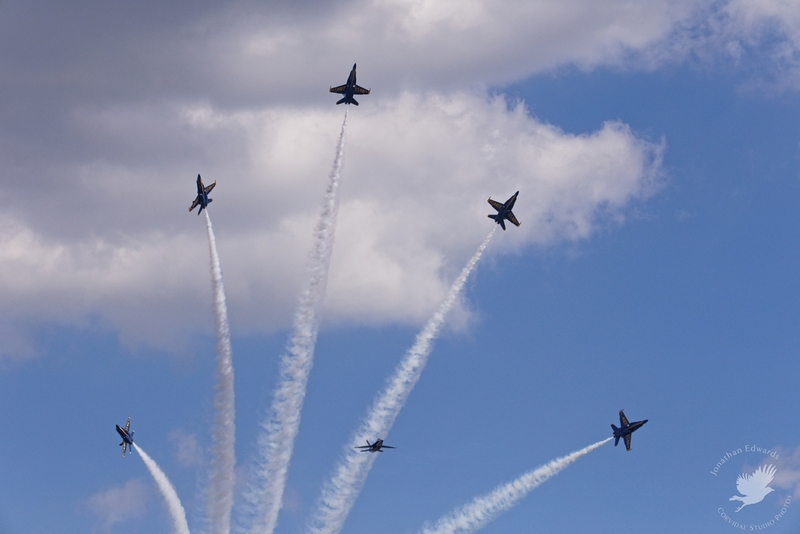 The Blue Angels finished their fairly lengthy routine with some excellent 6 ship formations, splitting up at the end to return to earth. 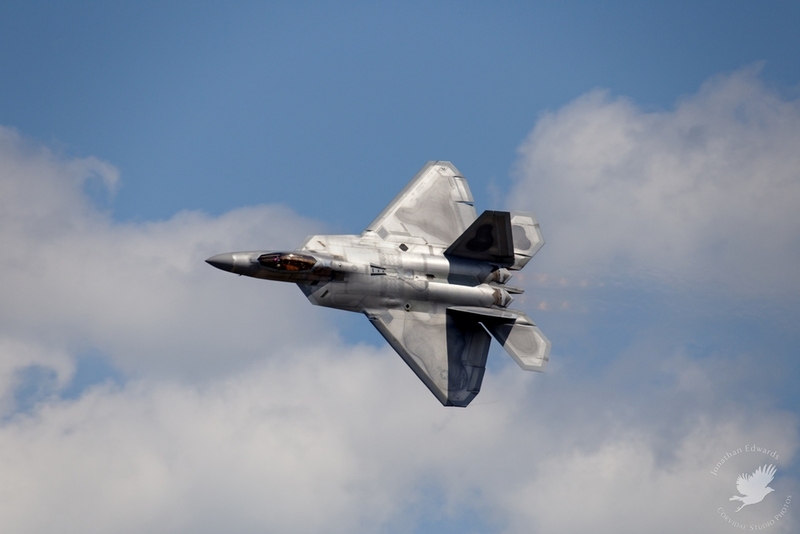 There was a lot to enjoy at The Great New England Airshow, but I'd have to say that there was a lot that would prevent me from returning as well, short of seeing something utterly unique to Westover. From a photographic perspective, the south facing nature of the airfield is problematic. It can be worked around but it's hardly ideal. Nothing that can be done about that though. More major issues though are access in and out of the base. Arriving at the base when the gates open was fine, but any later than that resulted in major delays driving onto the base, then standing in massive lineups to pass through security (more on that in a moment). On Saturday, we weren't that concerned because the weather was not great, but our start to finish time to enter the show was approximately 2.5 hours. The base only has two gates and all traffic funnels through them, surely using off-site parking and busing attendees in would be a better solution? As for security, especially regarding what could and couldn't be brought into the show, it was highly confusing with completely contradictory instructions both on web/social media and from National Guard troops on site. A friend with a Lowepro slingbag was allowed in with no issue, whereas Ann was turned back with the exact same bag, then allowed in with some camera gear in her "purse" (actually a camera bag as well but more of a satchel type bag). I have no issue with security measures and with last year's Boston Marathon attacks, I am very much on-board with the necessity of those measures, but if you're going to make lists of what can be brought in, please have a clear policy and stick to it. On Sunday we didn't even bother with bags and just carried our gear in our hands, with the assumption of low chance of rain. I'd rather that the policy be no bags whatsoever, that way security is faster and everyone is treated fairly. On a technical level, I used my Canon 6D with the Sigma 150-600mm OS DG HSM Sports lens used both handheld (for faster aerobatic shots) and on a Jobu Designs gimbaled monopod. This was the first time I had used this combination and I'm glad I had the monopod for support for the Sigma as shooting handheld with this lens all day wouldn't be a pleasant activity. The 6D did ok, showing its shortcomings with regard to AF performance and burst shooting rate, both being on the slow side. With practice it's workable though and until such time as I can afford a higher grade body, it'll be the combo I use for most aviation stuff. I am however very pleased with the image quality of the Sigma. Static shots were with my EOS M and EF-S 10-22mm f3.5-4.5. Ann used her Canon 60D with EF 300mm f4L IS and 24-105mm f4L IS. All that said, the show itself was good, well paced, with an interesting lineup. If you're in the west Massachusetts area and want to take in a good show, it's worth seeing. 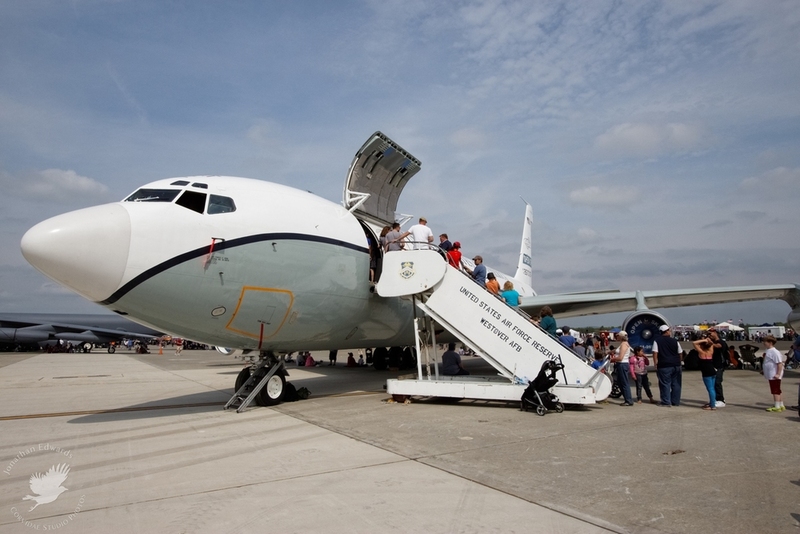 Be forewarned, plan to arrive at gates open, and prepare to take a long time (2 hours in our case) to get off the base at the end of the day. As a photographer, I can't really recommend it due to the south facing setup, the far show line, and inconsistent security, unless you're local to Westover ARB and don't plan on attending any other shows. 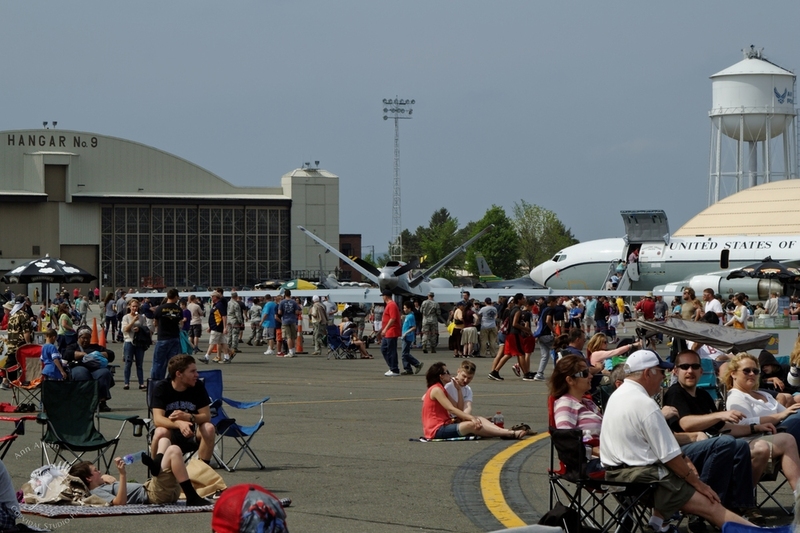 I'm glad I went The Great New England Airshow, but unless I happen to be in the area, I'll be scheduling alternative events for that weekend in the future. PS: I also have to mention something which I forgot to include the first time around, the Laurel and Hardy act next to us was both sad and hilarious. Two guys that were taking photos fancied themselves important enough to have 2 extra chairs to use as a buffer zone around the two of them as well as cordoning off their little fiefdom with caution tape. I'm amazed no security people hassled them about it, it was definitely one of the more obnoxious things I've seen photographers do at an airshow. Real classy there guys.